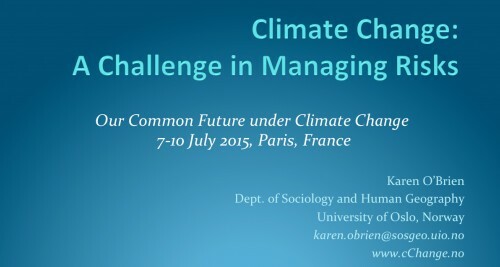 Today I’d like to talk about climate change as a challenge in managing risks. It is a challenge of managing risks that we ourselves are contributing to, where the stakes are very high and the timing of our responses truly matters. Drawing on findings from the Fifth Assessment Report from Working Group II, I want to talk about climate change risks in terms of the old game of risk, the new game of risk, and the real risk that we face. In fact, what I will argue is that the biggest risk of all is the risk that we are addressing the wrong problem. Before I get to that, let me first talk about risk. Risk is defined in the WGII glossary as “the potential for consequences where something of value is at stake and where the outcome is uncertain, recognizing the diversity of values.” There is a lot of great research on consequences, outcomes and uncertainties related to climate change risks; it is when we introduce values — and particularly the diversity of values – that risk management becomes more complicated, because values influence how we perceive both problems and solutions. Let me give you an example. 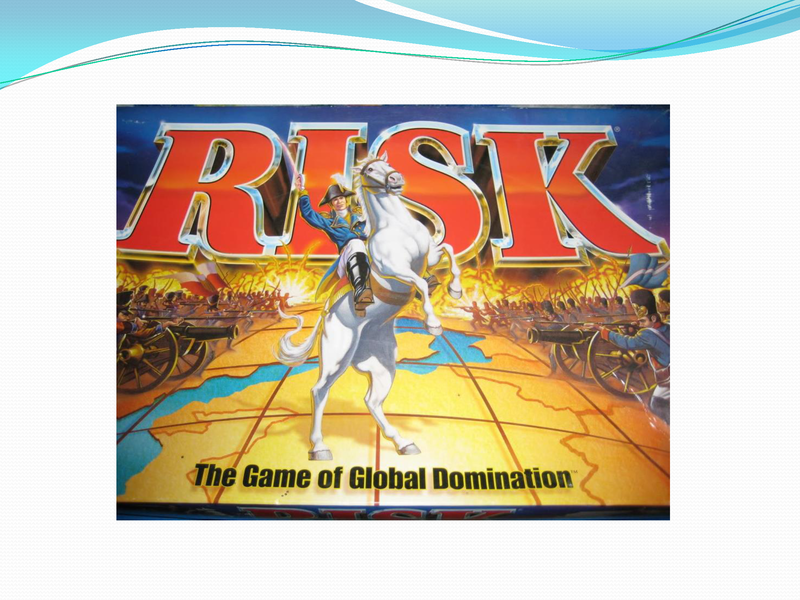 When I was growing up there was a popular board game called Risk, which some of you may have played. 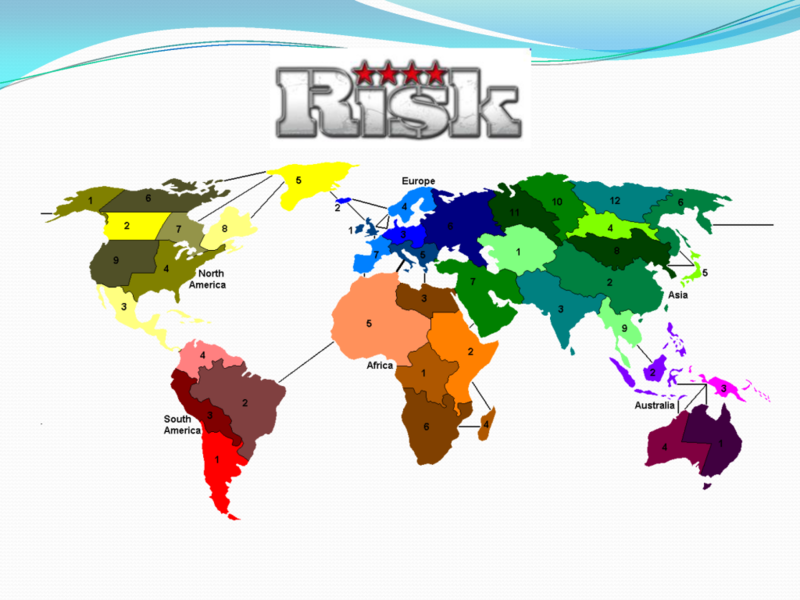 Risk is a military strategy game developed during the Cold War, and the goal is to occupy every territory on the board and in doing so, eliminate the other players. A high value is placed on competing, strategizing, conquering, and as with most games, winning. It represents a particular approach to managing risk, and one that remains popular. 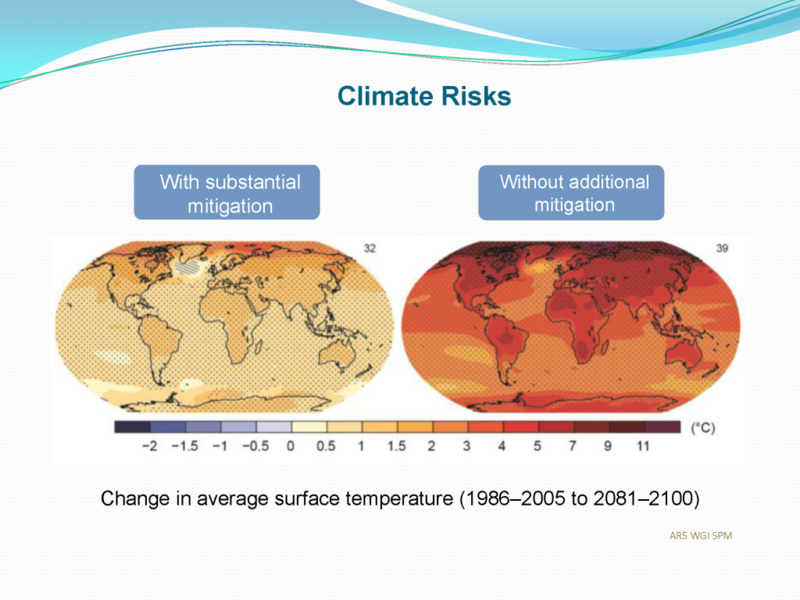 Kids today are playing Star Wars Risk, Lord of the Rings Risk, and Plants versus Zombies Risk, but what I want to talk about today is approaches to Climate Change Risk. Let’s look more closely at this approach to risk. The Risk board depicts a political map of the world, divided into forty-two territories, which are grouped into six continents. In this military strategy game, capturing a territory depends on the number of attacking and defending armies – in climate change this would translate into resources and capacities. A battle’s outcome is decided by probabilities – by rolling dice. As with climate change scenarios, we can analyze potential probability outcomes in the game of Risk using Markov chains, stochastic simulations and so on. The rules of this game neither endorse nor prohibit alliances or truces – in other words, collaboration among players. However, according to the Wikipedia description, “alliance making/breaking is considered to be one of the most important elements of the game, and it adds human interaction to a decidedly probabilistic game.” Adding human interactions to a decidedly probabilistic game becomes even more important in the case of climate change risks, for this introduces the potential for individual and collective transformations that can actually change the game, and we certainly need game changers. This challenge of climate change risk is revealed clearly in this temperature map, which shows what the world might look like by the end of this century. 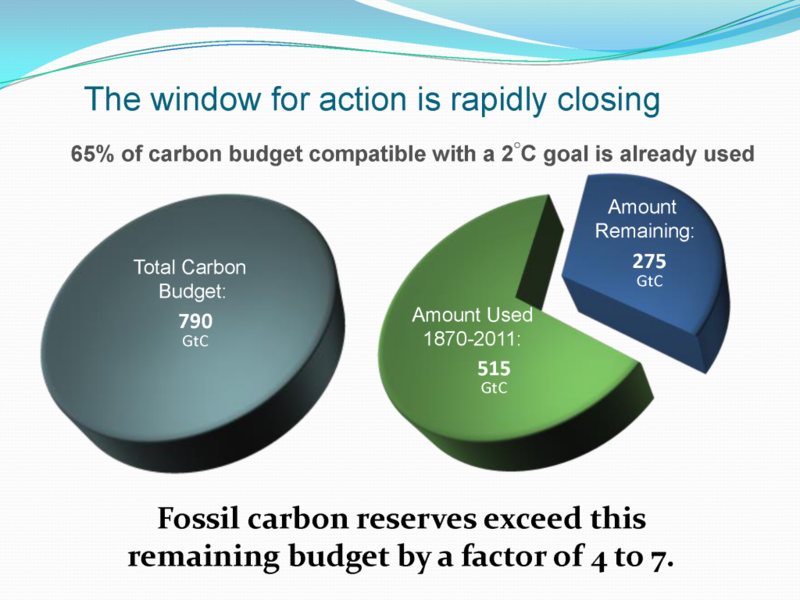 We see here two potential scenarios – a 2°C warmer world with substantial mitigation and a 4°C warmer world without additional mitigation. Theses maps capture two very different outcomes from climate change, each associated with very different levels of risks. The risks and outcomes that we will experience in this century and beyond are dependent on human responses. 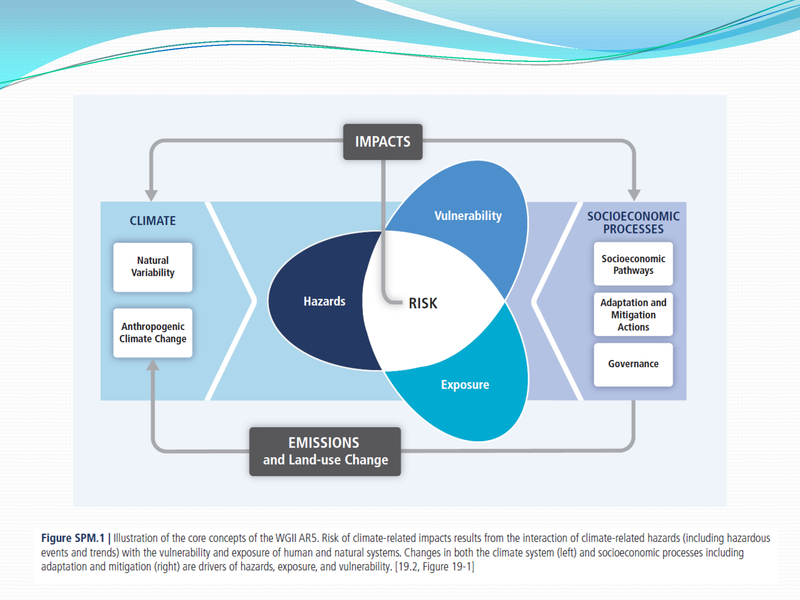 This figure from WGII emphasizes that the risks associated with climate change are not just a result of climate hazards — they are also influenced by exposure and vulnerability, which are in turn influenced by socioeconomic processes, including development pathways, governance and not the least, adaptation and mitigation responses. Risks are not just about carbon dioxide – they are also linked to socioeconomic conditions that shape the context in which we both create and experience risk. With this knowledge, managing risks means addressing the human dimensions. This requires better understandings of social change, our potential for collective agency and action, our capacity to adapt, and most of all, our ability to transform systems and structures in conscious, deliberate ways to promote sustainability. Many people point out that the climate has always changed, and that humans have always adapted. But we know that the capacity to adapt to climate change is influenced by the rate, magnitude and timing of change, including changes in climate variability and extreme events, and also socioeconomic conditions and processes. 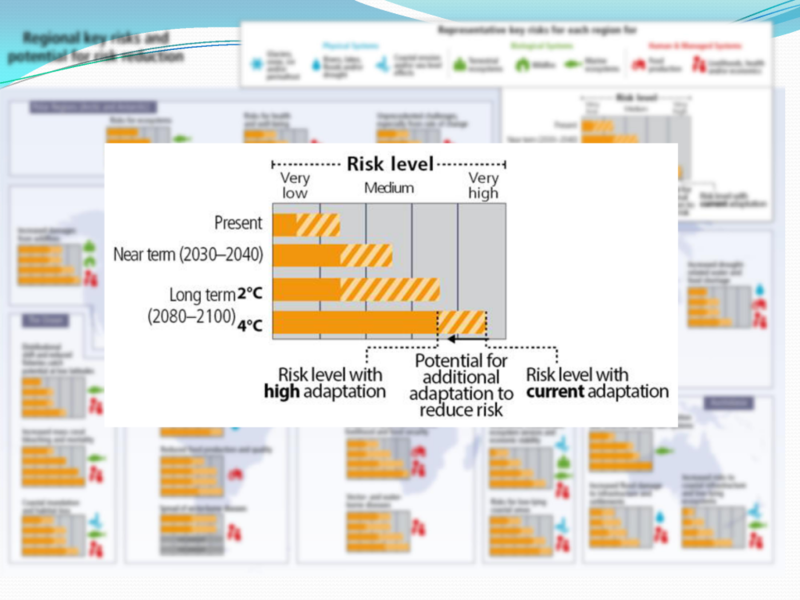 IPCC Working Group II presents an analysis of regional risks based on both research and expert judgment, and considers the risks for the present, near-term, and long term, which is based on both 2°C and 4°C scenarios. Both current adaptation and the potential for increased adaptation are considered in the assessment of risks. When we look at the global picture, clear patterns emerge: both risk and adaptation needs to increase with higher scenarios of change. 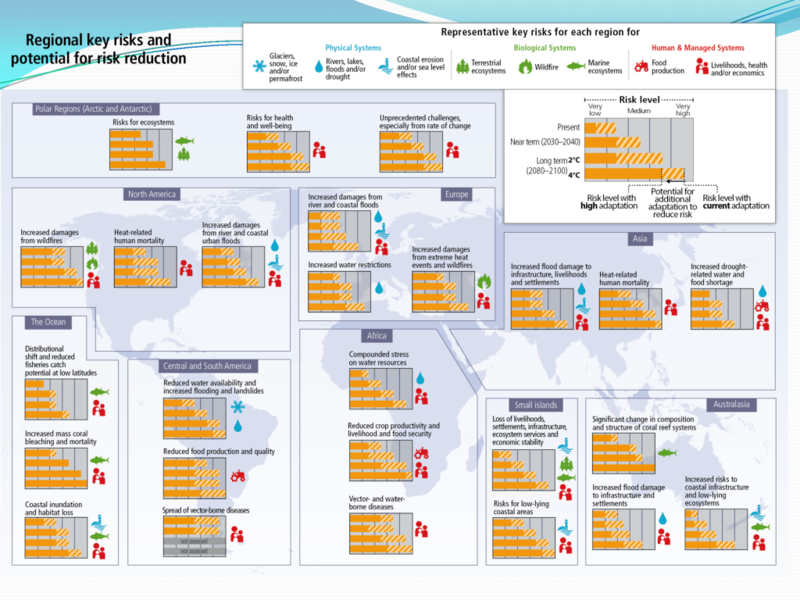 Here we see some examples of regional risks for various sectors. While adaptation can play an important role in reducing current and near-term risk — and in some cases risks associated with 2°C scenarios – in these examples it does little to reduce risks in a 4°C warmer world. In other words, we see that there are limits to adaptation as a means of reducing or managing risk. If we focus on heat events in Europe, we see that risks are likely to increase, even with increased adaptation. These are only a sampling of the sectors that will be affected. The maps do not reflect what we know about the distribution of impacts – we know, for example, that some social groups are more vulnerable than others, that these outcomes will occur in the context of multiple stressors, and that the capacity to adapt is not evenly distributed. We also know that in a globalized world, changes or responses in one region or sector can have consequences for others. In fact, we know that one group or sector’s adaptation can potentially increase vulnerability for others. 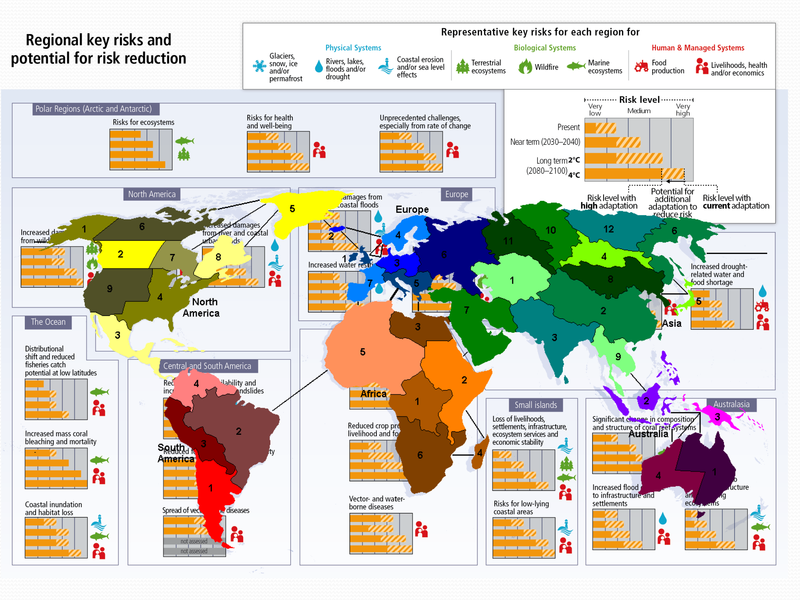 The question is, can our old strategies for managing risk address today’s climate challenges? 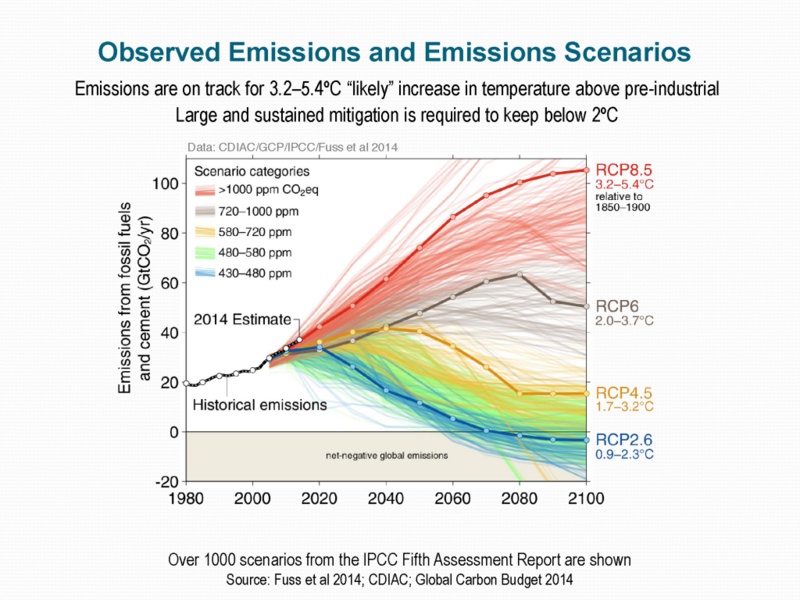 If we look at the actual emissions curves and potential scenarios for the future, business as usual is leading us towards a global average temperature increase of 4°C by the end of the century, and it is clear that holding warming to below 2°C will require some transformative changes. Given what we know about the risks, how do we do this? We know that we need to reduce CO2 emissions, and it is clear that the window for action is rapidly closing; 65% of the carbon budget compatible with a 2◦C goal is already used, and fossil carbon reserves exceed this remaining budget by a factor of 4 to 7. How can we keep these resources “unused”? 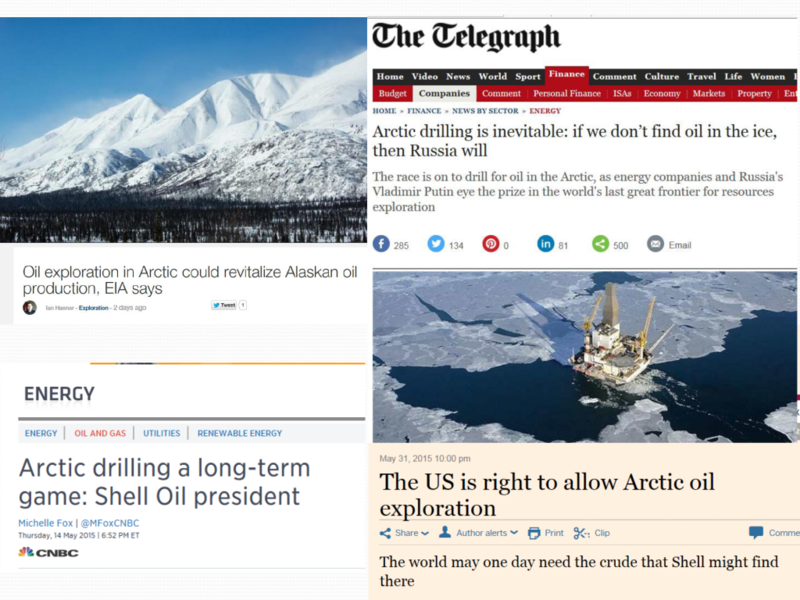 Here are a few recent headlines about drilling for oil in the Arctic: Arctic drilling is inevitable: if we don’t find it, then someone else will; We may need it for the future; It can revitalize the economy; We are in this oil game for the long-term. This sounds more like the old game of risk, with ambitions to limit climate change competing with vested interests and big investments. Risk is clearly not just about the diversity of values — it is about whose values count. 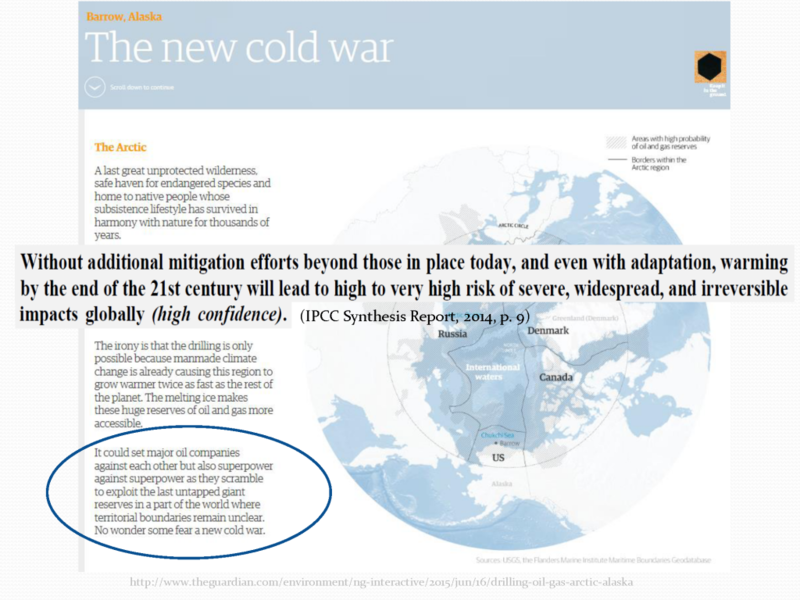 This approach ignores the key findings from the IPCC Fifth Assessment, which concludes with high confidence that “without additional mitigation, and even with adaptation, warming by the end of the 21st century will lead to high to very high risk of severe, widespread and irreversible impacts globally.” We don’t seem to be doing a great job managing climate change risks. To do so, I would argue that we need to face the real risk. The real risk is that we are addressing the wrong problem. Here I draw attention to a distinction, made by Ron Heifetz and his colleagues, between technical problems and adaptive challenges. This is something that I have been thinking a lot about in relation to climate change. A technical problem is one that can be diagnosed and solved by applying or improving established knowledge, know-how and expertise. We seem to be approaching climate change as exactly this: In relation to both mitigation and adaptation, there is a focus on developing renewable energy resources, building higher bridges and sea walls, breeding drought-tolerant crops, coming up with new insurance schemes, improving early warning systems, designing new international agreements, promoting innovation and so on. There is absolutely no doubt that these are important, but climate change is more than a technical problem. It is something that can be referred to as an adaptive challenge. Adaptive challenges are problems that draw attention to mindsets and ways of making meaning. They focus on the diverse beliefs, values, and worldviews that we hold, individually and collectively, which influence our identities, interests and loyalties. Adaptive challenges almost always have important technical dimensions, but unless the adaptive elements are addressed, technical responses alone are likely to fail. While knowledge and expertise are key to managing technical problems, beliefs, assumptions, values and even emotions are key to addressing adaptive challenges. There are two important aspects of adaptive challenges. 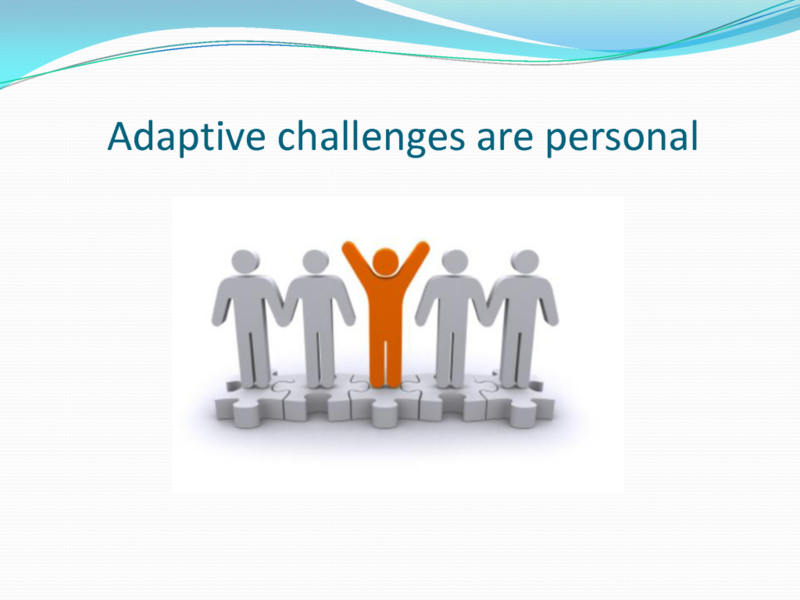 First, adaptive challenges are personal. This is because they draw attention to our individual and shared beliefs about the way that the world works, about how we relate to each other and to the environment, and how we influence the future. Many of our beliefs and assumptions are transparent or invisible to reflection and introspection. But they still influence how we perceive and frame problems and solutions. Confronting adaptive challenges can be uncomfortable, because they often threaten our identities and interests, and bring up emotions and feelings we would rather avoid. However, research shows that we tend to see what we believe, so it is important to recognize where our individual and collective blind spots might be when it comes to managing climate risks. For example, we all hold implicit beliefs about human agency – whether we as individuals can influence systems and structures and make a difference in the world, or whether everything is more or less determined by forces outside our control. Some believe that consciousness and free will do not really exist, and that everything is determined by natural and physical processes; some believe that even if we have agency, systems and structures constrain our actions; some believe that there is a close relationships between individuals and systems; and some believe that there are multiple worlds where every potential decision or action is being realized in an alternate universe. Whatever one believes, climate change gives us clear evidence that we do have the capacity to influence large, complex systems. This suggests that maybe we do have the capacity to influence complex social systems as well. 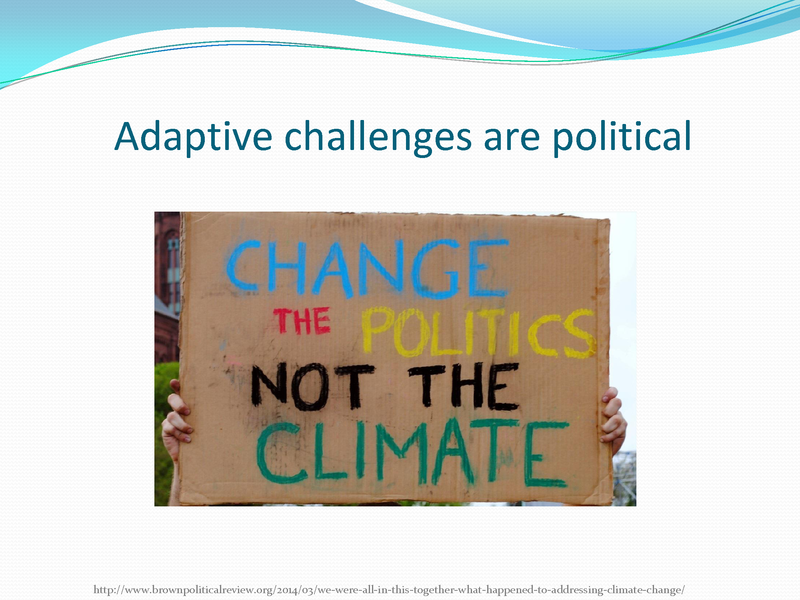 The second characteristic of adaptive challenges is that they are political. They involve challenging the given – what we take for granted and assume “just is”. They involve questioning existing orthodoxies, including assumptions about determinism, dualism, materialism, capitalism, consumerism or other -isms. Adaptive challenges draw attention to different ways of knowing, being, and doing. This might mean defying social consensuses by creating alternatives. Or it might mean challenging traditional notions of power by recognizing the significance of collaborative power and collective empowerment. There is exciting research and writing in the social sciences and humanities suggesting that we have more agency and potential for collective action we think – this includes research on social networks, post-structuralism, post-humanism, quantum social theory, new materialism, post-oppositional politics, and so on. This research shows that small changes can make a big difference, and that individuals working together can generate rapid social change. Climate change is not a post-political issue where we just need to look beyond our differences and cooperate; instead we need to make differences in beliefs and values clear, then use both personal and political transformations to promote systemic change. Transformations are happening, one way or another, and the challenge of managing risks is really about what types of risks we are willing to accept, what types of values we prioritize, and whose values count in deciding the future. Our responses to change are never neutral, and if we want to avoid the risk of severe, widespread, and irreversible global impacts, we need to approach climate change as much more than a technical problem. We do need to develop renewable energy, change infrastructure, develop better early warning systems, and so on – in fact, we tend to be good at it. 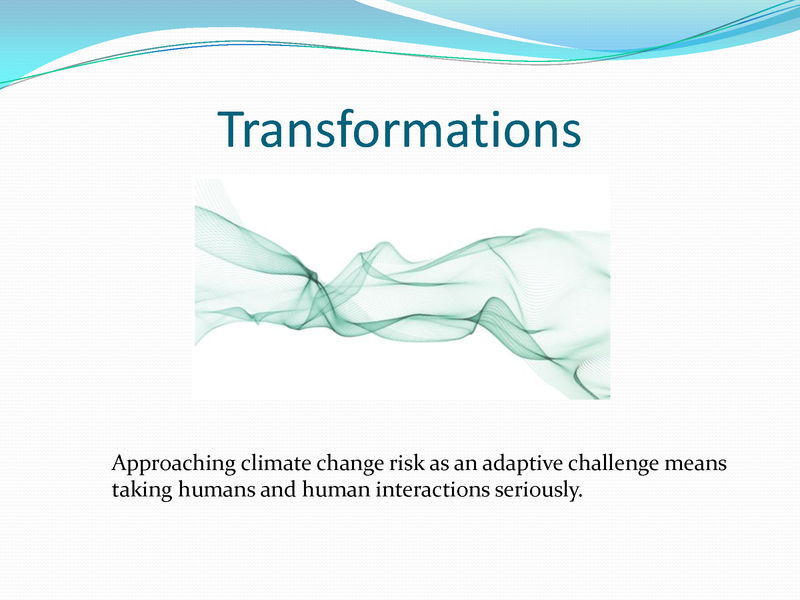 But if we ignore the adaptive elements of the problem, it is unlikely that we will be able to create the conditions for transformation at the rate, scale and quality that are needed to manage the risks of climate change. 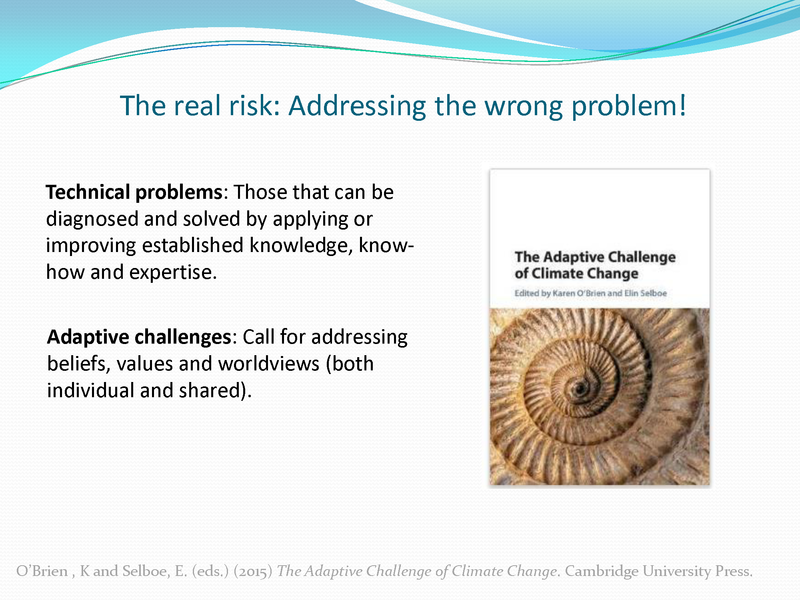 Approaching climate change risk as an adaptive challenge means taking humans and human interactions seriously. This calls for truly integrated global change research that recognizes the role of the social sciences and humanities in addressing the risks associated with climate change. The Future Earth global change research initiative is doing exactly this. We know that climate change risks are serious, but the real risk may be that we do not take ourselves seriously enough to meet the adaptive challenge of climate change. Humans are not just the problem; they are the solution to climate change! Download the pdf version of the key note slides presented here.